I’ve heard Prague described as Disneyland for adults, and it’s not inaccurate. It’s a beautiful city with plenty of history and beautiful architecture. I have also heard quite a few comparisons between it and Budapest, each seemingly competing for the crown of the “Paris of Eastern Europe.” I would find it extremely hard to pick a winner between the two, and I really do think each is well worth a visit, and I don’t think anyone would be at all disappointed by either city. Both cities are extremely photogenic, have fascinating histories, and are quite cheap relative to their western European counterparts. The biggest differentiating factor I noticed was the scale of each. The old area of Prague which is likely where most visitors would be interested in spending time, is quite compact and easy to cover on foot, while Budapest and its points of interest are considerably more spread out. 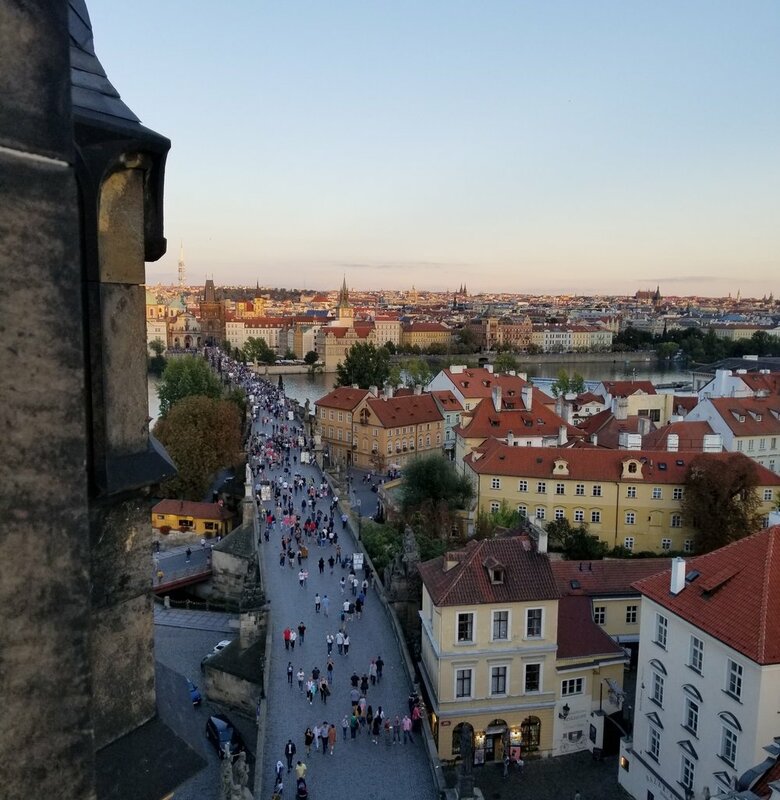 Above is the Charles Bridge, probably Prague’s biggest tourist attraction. Despite visiting during the shoulder season, it was absolutely packed with tourists every time I was there. The bridge is quite nice, but the tourist hordes sort of ruined it for me. On the other hand, the bridge did make it much easier to avoid said hordes. The tourist crowds were extremely easy to predict and avoid purely by their proximity to the bridge. The further from the bridge, the fewer crowds I encountered, it was just that simple. The other thing that really made Prague enjoyable was the aforementioned affordability. I don’t think I spent more than 25 USD on a meal my entire trip, and in most cases that included several glasses of wine. If you aren’t consuming alcohol or trying to stuff yourself, you could probably spend considerably less. The only thing that turned out to be a little more costly was cab rides. I took one cab from the airport to my hotel in the center of the city for around 20 USD, and on the way back, I asked for my hotel to arrange the transport, which ended up costing even more. I’m sure there are cheaper ways to get to and from the airport, but I just didn’t have the desire to figure them out, so I was content to pay the high tourist prices. Spending so little on the rest of the trip certainly makes this more bearable. While in Prague I spent a few nights at the Intercontinental Prague, and a few nights at Hotel UNIC. Like most things in Prague, the Intercontinental is pretty cheap, I paid cash and it only came out to around 125 USD per night. Pros - It’s very nice, the service is great, and the location can’t be beat. It’s right on the river, and is very close to most of the sites you’d probably want to see. Cons - no free meals, it’s a little dated and it is totally lacking in power outlets. I think there was only one in my room. Hotel UNIC is also very nice, and depending on the time of year you go, you should be able to score a room for around 80 USD per night. Pros - cheap, quiet, phenomenal breakfast included. Really, the breakfast is solid, at least give it a try. Cons - not quite as luxurious as the Intercontinental, further from popular tourist stuff, no points/miles to be had or redeemed.